Premiere Cinemas and Warner Brothers Studios announced today a one-time-only ADVANCE SCREENING and MOVIE MARATHON at Premiere's El Paso IMAX of the Hobbit trilogy. The 3-movie marathon is Monday December 15th, and gives audiences the rare opportunity to see the latest and final Hobbit chapter two full days ahead of the scheduled national release at other theatres. "This is super-exciting because a select number of Premiere movie-goers can see the new movie before anyone else," said El Paso marketing Director Gabby Berrera. "IMAX is such a special way to experience a movie, and this is going to be a phenomenal day for El Paso audiences!" The Hobbit marathon starts at 12:15 p.m., beginning with "An Unexpected Journey", followed by "Desolation of Smaug", then followed by the new and final chapter "The Battle of Five Armies". Admission for all three movies is $35.00 and all are presented in genuine IMAX 3D on Premiere's massive 70' wide screen. "The sell-out probability is considered pretty high so we're recommending to our guests to go on line and buy their tickets early," added Ms. Berrera. Premiere serves gourmet hand-made-to-order pizzas, and features a full-service Starbucks and fireside adult-beverage bar (The Backstage Bar) for people to relax and hang-out before or after the movie. "Being in the mall its a perfect place and a perfect way to spend a day with friends and be entertained," said Ms. Berrrera. 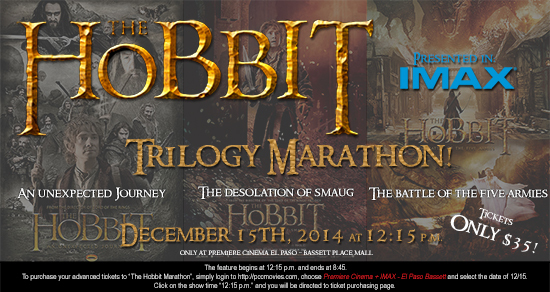 Marathon tickets are on sale now and can be purchased at Premiere Cinema + IMAX - El Paso Bassett.